Presidential Conversations on the Constitution Former Presidents Gerald Ford, Jimmy Carter and George H.W. Bush discuss the historic events that defined their terms in office with NPR Senior News Analyst Cokie Roberts. The series is produced by WHYY in Philadelphia in cooperation with the National Constitution Center. 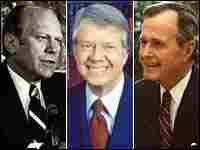 Former Presidents Gerald Ford, Jimmy Carter and George H.W. Bush discuss the historic events that defined their terms in office in Presidential Conversations on the Constitution, a new radio series to be broadcast on NPR member stations and a television series distributed to public television stations throughout October. Produced by WHYY in Philadelphia in cooperation with the National Constitution Center, the series features one-hour interviews conducted by NPR Senior News Analyst Cokie Roberts. Excerpts of the interviews will be featured on Morning Edition. When Philadelphia neighbors WHYY and the new National Constitution Center approached me about doing a series of conversations with former presidents about their thoughts on the Constitution, I leapt at the chance. After all, only 42 men in history have looked at the nation's charter from the perspective of the chief executive. And I was eager to see how the living presidents' experience in office affected their views. The interviews with Presidents Ford, Carter and George H.W. Bush were conducted in 2003 at places of their choosing. For both Presidents Carter and Bush, that meant their presidential libraries. Unfortunately, President Clinton was still writing his book at that time, and had an agreement with his publisher not to talk about these issues until his book tour. As you know, it was while he was still on tour that he discovered his heart problems. We are hoping that once he is feeling better we will be able to add his recollections and reflections to this series of conversations. Frontline: What Makes a Good President?